Founded in 2010, LunaTik creates unique products ranging from watch kits to cases. 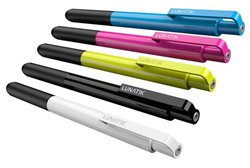 PureMobile is pleased to now be carrying LunaTik's collection of styluses for the iPad, and other top tablets. PureMobile is pleased to be offering unique products designed and manufactured by LunaTik. LunaTik specializes in creating unique accessories using a wide variety of materials and technologies. LunaTik burst onto the scene following a successful campaign on Kickstarter, and followed that up with their first dynamic products, the LunaTik and TikTok watch kits. PureMobile now carries LunaTik's new Chubby Stylus and Touch Pen stylus for iPad, the iPad Mini, and other top tablets. PureMobile's Online Store features LunaTik's Chubby Stylus in five expressive colors and the Touch Pen in seven unique colors and finishes. LunaTik's Chubby stylus is the best iPad stylus for drawing and writing due to its unique shape that makes it comfortable and easy for people of all ages and hand sizes to use. LunaTik's Touch Pen also delivers as a stylus, but also features a retractable pen tip, making the transition from tablet to paper seamless and fun. LunaTik, which was founded in 2010, is a company that combines excellent and unique designs with a passionate dedication towards craftsmanship and quality. LunaTik burst onto the scene after launching a highly successful campaign to fund their debut projects, the LunaTik and TikTok watch kits. LunaTik has since then followed that up with two further campaigns and continue to produce high quality watch kits, cases, and styli. PureMobile carries accessories for phones, tablets, and laptops by Apple, Samsung, HTC, Sony, BlackBerry, and more at prices up to 75% off retail prices. PureMobile offers personalized customer service, a comprehensive customer loyalty program, exciting promotions, and a price match promise to beat any price you find online. PureMobile also offers numerous articles to help you troubleshoot, outfit, and select the best phone for you using our all-new and growing resource section. PureMobile also keeps you up to date on mobile news with their Insider Blog.